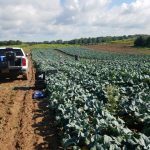 The loamy, fertile soils common to upstate New York are ideal for the production of broccoli and other cole crops. Western portions of the state have several mid-sized and larger producers; smaller-scale production occurs in other parts of the state, including the Finger Lakes region, the St. Lawrence River River Valley, and Long Island. Upstate New York faces some of the most variable and unpredictable conditions in the Eastern U.S. Most growing seasons include periods of heavy rainfall, droughts, cool spells, and heat waves. Because of this variability, New York trials provide a good test for the broad adaptation needed for a new hybrid to perform well in multiple eastern environments. Both Quality and Yield trials run in New York. 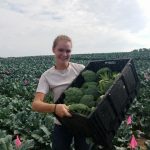 Quality trials are conducted in Geneva, NY by Phillip Griffiths, who heads the broccoli breeding program at Cornell University and oversees the Quality trial component of the Eastern broccoli project. Griffiths plants trials in single rows on plastic-covered raised beds to simplify weed and irrigation management. Trials are transplanted in early/mid-June, late June/early July, and mid/late July for evaluations that run from mid-July through October. 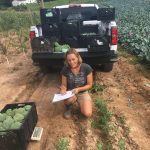 Christy Hoepting of the Cornell vegetable program conducts a Yield trial each year in western New York, where much of the broccoli is grown on land formerly used for cabbage production. 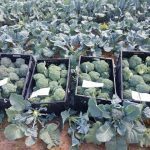 The Yield trial is planted in mid-June for harvest in early August, a few weeks earlier than would be recommended for older broccoli varieties. Photos shown below are from the 2017 NY Yield trial. Trial leader Christy Hoepting weighs marketable heads from the New York Yield trial. 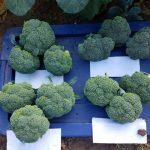 Newly harvested crowns from four broccoli cultivars in the 2017 NY Yield trial.